FLORIDA -- Authorities have seized 72 sickly cats in unsanitary conditions and filed a sworn complaint alleging animal cruelty against an Alachua County woman. 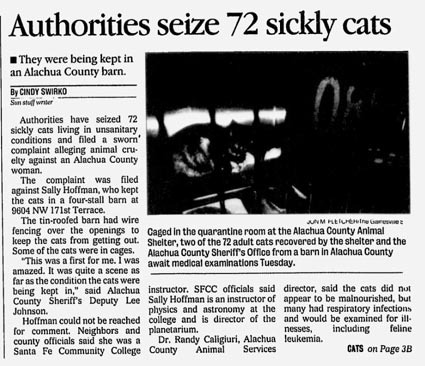 The complaint was filed against SALLY HOFFMAN, who kept the cats in a four-stall barn at 9604 NW 171st Terrace. The tin-roofed barn had wire fencing over the openings to keep the cats from escaping. Some of the cats were locked in cages. "This was a first for me. I was amazed. It was quite a scene as far as the condition the cats were being kept in," said Alachua County Sheriff's Deputy Lee Johnson. Hoffman could not be reached for comment. Neighbors and county officials said she was a Santa Fe Community College instructor. 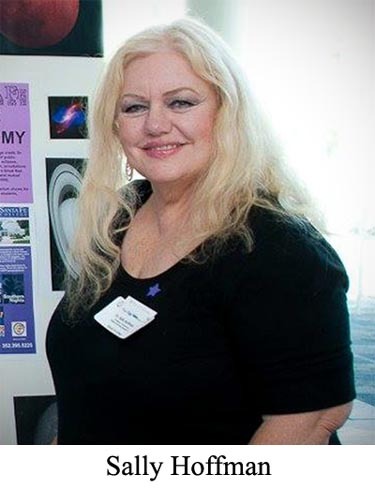 SFCC officials said Sally Hoffman is an instructor of Physics and Astronomy at the college and is Director of the Planetarium. Dr. Randy Caligiuri, Alachua County Animal Services director, said the cats did not appear to be malnourished, but many had respiratory infections and would be examined for illnesses, including feline leukemia. "One stall had 25 cats. One stall had 27 cats. One cat was in an area built off the stalls that had a leukemia sign on it," Caligiuri said. "The main thing was the squalor they were living in. There was a trash heap waist-high. In the stalls, it looked like kitty litter was just dumped in a corner, and it mounded up over 2 feet. The food was mounded in turkey basting pans. There was some food spilled over the kitty litter manure floor, and they had to eat off the floor. One area had moldy food. Some of the water had algae and kitty litter manure." Penny Lefkowitz, Animal Services' interim field supervisor, said the agency learned of the cats because neighbors complained of the cats' cries and the stench. Neighbors said Hoffman did not live on the overgrown property, which has an older single-wide mobile home, a junked car and the barn. George Yates, who lives nearby, said Hoffman typically came to tend to the cats and then left. She rarely socialized with neighbors, Yates said. "She's been there about three or four years. She fixed up the shed and then brought the cats in," Yates said. "She'd come out sometimes at midnight. I talked to her a couple of times at the gate, but there wasn't much communication between her and the people out here." Caligiuri said the biggest concern is the spread of feline leukemia among the cats. He added that a lot of the cats did not seem socialized to people. Shelter Supervisor Meredith Shields said the seizure of so many cats has put a premium on shelter space that was already limited. The cats were removed Monday. Most of the cats were placed in pairs in a cage. They're a forlorn sight. Most lay cuddled together in the back of their cages, wheezing and watering from the eyes. A few rubbed their bodies against the doors, eager for a human hand. Caligiuri said Hoffman told Animal Services she took in the cats from people who moved or were unable to keep their cats. I'm sure she got some cats this way but I'll bet she was trapping people's pets too and stealing them. Many of the male cats were not neutered. Caligiuri said Hoffman said mothers with kittens were separated from the rest of the cats and homes were found for the kittens. The article makes no mention of Hoffman being charged with animal cruelty. Sally Hoffman (aka Sara Hoffman, Sara Witherow Hoffman, Sally Witherow Hoffman) died on December 19, 2014. She was 70 years old. The obituary says "Sally was a Professor of Astronomy and Physical Sciences at Santa Fe College in Gainesville for 40 continuous years from 1974 until her death" so it seems she suffered no ramifications for the suffering she inflicted on the cats locked in her barn. How many animals died at her hands that we'll never know about, whose bodies were simply thrown into the trash or into the field to rot? FLORIDA -- The little boy who was critically injured when he was mauled by a family dog in early January returned home Tuesday night. Garrett Brown, 23 months old, was still sedated and much of his head - including his eyes - remained bandaged, but his brothers and sisters were thrilled to see him. They even followed their parents' directions and cleared most of their toys off the floor. 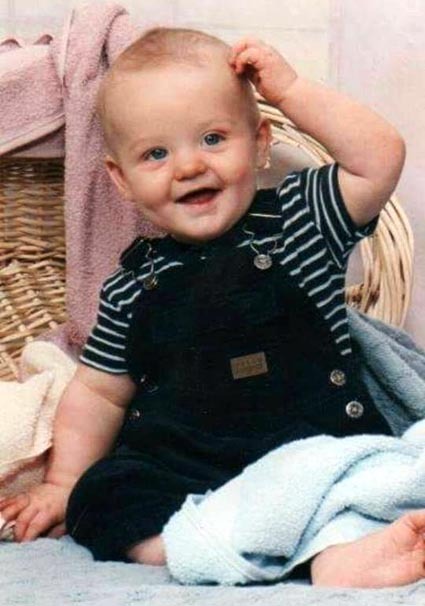 23 months old when he was attacked. "We are so glad to be back home and have him with us," said Bruce Brown, the boy's father and a Levy County paramedic. He was among the first on the scene to find his mauled son on Jan. 6. The attack happened minutes after the robust toddler learned how to open the outside door of the family's rural Levy County home. He slipped outside unseen while the others were getting ready for church. 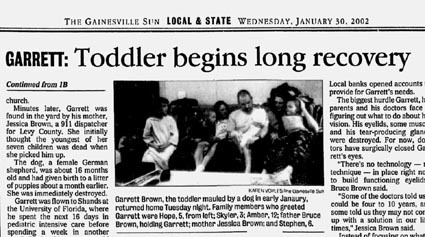 Minutes later, Garrett was found in the yard by his mother Jessica Brown, a 911 dispatcher for Levy County. She initially thought the youngest of her seven children was dead when she picked him up. The dog, a female German Shepherd, was about 1-1/2 years old and had given birth to a litter of puppies about a month earlier. She as immediately destroyed. The biggest hurdle Garrett, his parents and his doctors face is figuring out what to do about his vision. His eyelids, some muscle and his tear-producing glands were destroyed. 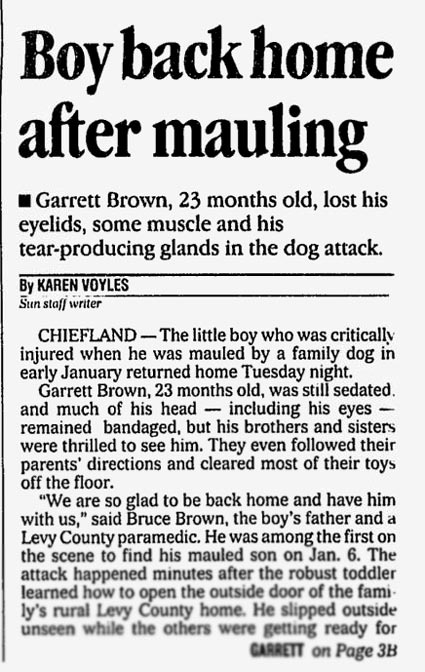 For now, doctors have surgically closed Garrett's eyes. "There's no technology - no technique - in place right now to build functioning eyelids," Bruce Brown said. "Some of the doctors told us it could be four to ten years, and some told us they may not come up with a solution in our lifetimes," Jessica Brown said. Instead of focusing on what is not available, the Browns are looking to the future for their youngest child.